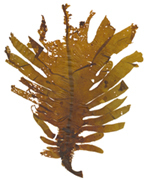 Seaweeds have always been an important part of the human diet in many countries, specially among the asiatic communities and some european regions like Wales, Ireland or Brittany; nowadays they experienced a worlwide new boom in vegetarian recipes and are in fashion in the actual cooking. Sushi is one of the most known seaweed meal with nori ingredient. Simple salad flavored with olive oil and lemon juice. An Irish dessert made with blackberries and the seaweed Chondrus crispus. Jelly dessert includes Irish moss (Chondrus crispus), sugar, and lemon juice. Brown rice flavored with kombu, sea salt, and sesame oil. 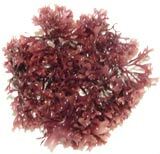 Recipes include sea lettuce seasoning and salad made with Irish moss, soup stock, and bread. Recipes to use kombu in any vegetable dishes, soup, marinades, kombu with rice, kombu with beans but specially for the japanese dashi. The algae ingredients are obtained in health food store, japonese and korean groceries, any asiatic food shops or natural food commerce.